How many steelmakers ever take a write-down due to...natural gas wells? Nucor just did. Well, that was weird. 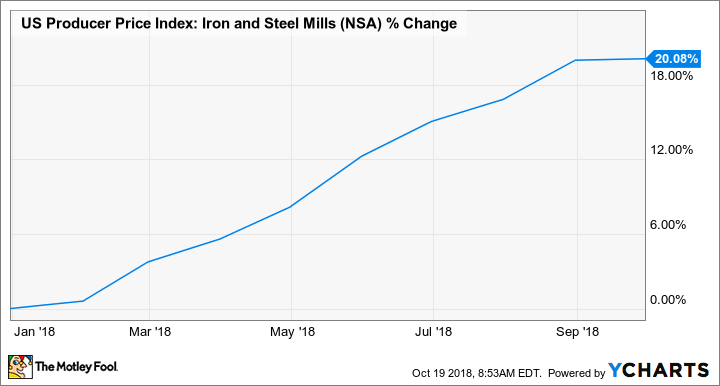 North American steelmaker giant Nucor Corporation (NYSE:NUE) reported third-quarter results on October 18, yet again turning in a very strong quarter. With earnings of $2.13 per share, it matched its second-quarter result, which was good for second-best in Nucor's long history and easily its most profitable quarter in the past decade. The weird part? It should have been Nucor's best quarter ever, but the company had to take a non-cash impairment charge that knocked $0.26 per share off of its earnings, due to -- of all things -- the decline in value of its natural gas reserves. That's right; Nucor owns natural gas wells. Or more accurately, it has held an interest in natural gas production since at least 2010 as part of its strategy to hedge energy costs for its DRI (direct-reduced iron) production. Let's take a closer look at Nucor's third-quarter results, breaking out operations and cash flows, and explain the implications of its natural gas interests and how that affects the company (spoiler: it's far more good than bad). We will also take a look at what to expect going forward. Here's a breakdown of some key financial and operating metrics from Nucor's third quarter. Data source: Nucor. *Revenue, net income, and operating cash flow in millions. YOY = year over year. Nucor's earnings and cash flows surged from last year, accelerating much higher than the 18% revenue growth the company reported. The big reason this happened was, in short, something called operating leverage. As a large manufacturer, once Nucor's steelmaker facilities reach a certain level of production and pricing, the vast majority of its overhead expenses are covered. This means incremental production, higher prices, or some combination of both generates a substantial boost in cash flows and earnings. Nucor saw both higher production and prices in the third quarter. Total shipments to outside customers increased 6% to 7,048 tons, while the average sales price per ton increased 23%. This increase in volume and pricing generated substantially higher cash flows, with operating cash flows surging to nearly $2 billion in the quarter. The operating rate of Nucor's facilities was also substantially higher, at 92%, up from 84% year over year. On a sequential basis, Nucor's operations slowed a bit. Total tons shipped to outside customers slipped 2% from second-quarter levels, decreasing the operating rate from 95% to 92%. Fortunately, higher prices made up the difference, offsetting the lower volume and keeping earnings strong. Over the past several years, steel imports have flooded North American markets, peaking above 30%, substantially higher than the historical average, which has been much closer to 20%. Many domestic steelmakers have accused foreign governments, including China, of subsidizing their steel producers, an illegal act in violation of international trade law. Starting under the Obama administration, a series of trade actions including duties and tariffs were passed to push back against this anti-competitive trade, and they made some improvement, but not enough as far as the U.S. steel industry was concerned. Let's fast-forward to the Trump Administration's massive 25% tariff on the majority of steel imports, enacted early this year. US Producer Price Index: Iron and Steel Mills data by YCharts. ... if you look at last year, imports accounted for 27% of the market. We've got that down now to 24%. Historically, imports should be somewhere in the neighborhood [of] 15% to 20%. And also don't know if I have the numbers exactly right, but when you lower that import from 27%, 28% down to somewhere in the neighborhood of 15%, you are basically eliminating 12 million tons or 13 million tons, then [it] gives you that amount of room to grow with the product that's produced domestically. In short, Ferriola expects further declines in foreign steel in the U.S. market, which should support Nucor's plans to expand its production, particularly in more "value-add" products where there is less product available. The persistent low selling price of natural gas caused Nucor to adjust the value of the proved reserves on its balance sheet down by $110 million in the quarter. This is a non-cash charge, and it doesn't materially affect Nucor's operations. It's just an accounting quirk that took a one-time bite out of Nucor's GAAP earnings this quarter. As a matter of fact, it's worth pointing out that in general, low natural gas prices are good for Nucor, since it consumes a substantial amount to produce direct-reduced iron, or DRI, which it then uses in its steelmaking operations. The downside here is that, since it sells the excess natural gas produced from its wells on the open market, it won't recognize as much benefit from those sales. However, since its natural gas interest is a hedge against higher prices, it's less of a concern today. 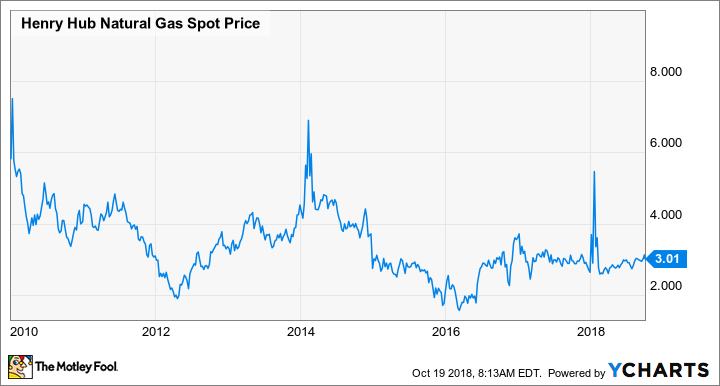 If gas prices were to increase (which they have recently) for a sustained period, Nucor could eventually revalue its gas reserves higher and take a gain on that value. The big takeaway: While still material, this doesn't have much of an affect on Nucor, at least in the current low-price environment. Its natural gas well interests aren't really helping it save money on energy costs, but they also aren't causing any material harm to its cash flows. However, if gas prices start creeping up even higher, the company will benefit from lower energy costs as well as a boost in cash flows it gets from selling excess natural gas production. Management expects that its fourth-quarter operations will once again see a small decline sequentially, driving earnings down from the third quarter, but they pointed out that it's typical seasonality, as fourth-quarter steel consumption is historically lower than in the third quarter. With that said, they still expect to generate substantially higher earnings and cash flows year over year. The company continues to sport an incredibly strong balance sheet, and it has plans to put that capital back to work. Since the beginning of the year, it has added $2 billion in working capital, while adding about $1 billion in net asset value. Debt is up about $1 billion, but this is entirely offset by an increase in cash and equivalents, much of which the company intends to deploy over the next year in capital expansion projects. Ferriola said on the earnings call that Nucor's capital expenditures will likely be "at least" 40% higher in 2019 than this year, tied to multiple internal expansion projects it has announced in recent months. The company hasn't yet given any guidance for 2019, and it likely won't until we get closer to the turn of the calendar. But as its results continue to demonstrate, there's no other steelmaker that does a better job operating across the various parts of the steel cycle. I'd expect Nucor's incredibly talented management team to continue doing just that.